This winter hat fuzzy lining is really soft, has better heat retention, enjoy the maximum warmth.Multi-function hat and scarf set,you can use it separate or together as you will. Stretchy Beanie and Scarf, beanie around from 22 to 23.6 inches,scarf perimeter about 20 inches, like some "one size fits most" can be.Suitable for women and men. The slouchy beanie completely covers your ears without having to yank it down all of the time,warm enough for outside and comfortable enough to leave it on inside. 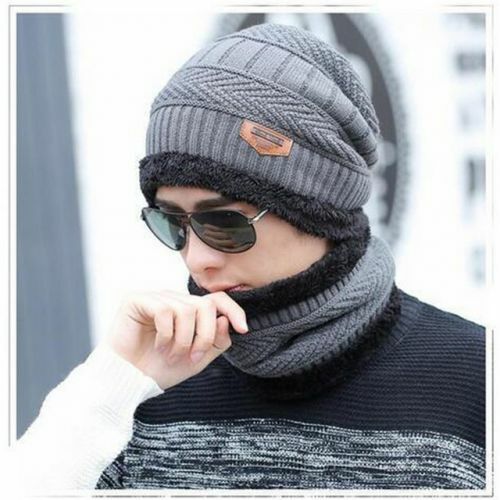 2-in-1 Men's and Women's winter hat and scarf set, stay warm all the time, great for outdoor activities and daily warmer.Best gift for your parents, friends, and yourself when the cold weather is coming.